Climate projections displayed in this map represent projections of the total average annual precipitation (inches/year) for the years 2010-2080 using current data, or one of two IPCC greenhouse gas concentration scenarios: a moderate emissions scenario (RCP 4.5) and a high emissions scenario (RCP 8.5). The datasets are intended to represent typical total annual precipitation for the decade indicated (either 2010, 2050 or 2080). Climate projections were developed by a University of Massachusetts Amherst team for the Northeast to evaluate the potential effects of climate change on wildlife habitat and ecological integrity from 2010 to 2080. Data courtesy of North Atlantic Landscape Conservation Cooperative. Water is essential to fish, wildlife, and forests. Too little water has obvious consequences, but too much water can also have negative impacts. Precipitation events can be important seasonal triggers for wildlife and fish to initiate and facilitate movements, influence stream and river flows, and fill aquifers and water bodies. Changes in the timing, intensity, and amounts of precipitation also affect the delivery of nutrients and pollutants to downstream and coastal habitats, especially from agriculture and developed areas. This can potentially lead to changes in ecosystem structure and function. Drought conditions also have important impacts on fish and wildlife species, especially those that depend on ephemeral or short-lived plants and habitats, such as vernal pools. Drought conditions affect stream flows, lake and pond levels, and water quality that fish and other aquatic species depend on for seasonal movements, spawning, overall health, and survival. Annual precipitation is increasing in Massachusetts and throughout New England. Regional annual precipitation amounts have increased at a rate of over 1 inch per decade since the late 1800s. In Massachusetts, annual precipitation is projected to continue to increase largely due to more intense precipitation events that last longer in duration. However, less frequent precipitation events are also expected, meaning more consecutive dry days or extreme dry spells. Therefore, even though it seems counterintuitive, heavy rainfall events that occur less often increase the risk for both flooding and drought. Seasonal precipitation over recent decades has shown the greatest increase in fall, followed by spring, summer, and lastly, winter. Climate models consistently project future seasonal precipitation being greatest in winter, though warmer air temperatures will result in more precipitation falling as rain instead of snow. Although total precipitation amounts in summer are projected to remain somewhat steady, rainfall events in the summer are anticipated to become more intense with longer dry periods between events; therefore, little change in summer precipitation totals are projected, with some models predicting drier summers overall. For spring and fall, model projections show small increases in precipitation in the Northeast relative to winter. It is important to note that there is less certainty in model projections for annual and seasonal precipitation compared to temperature. This is in part due to how climate models handle some complex atmospheric processes and how well climate drivers of precipitation are represented by different models. At the State-level, interpretation of future climate model projections should be used with caution. For example, one model may project increased rainfall in one part of Massachusetts, while another could show the opposite. Until model confidence in precipitation improves, local and State-level projections should consider a range of possible futures and decisions with the understanding that projections may become more consistent and reliable as research in this field continues to advance. The Northeast has already experienced a strong increase in the frequency and intensity of extreme precipitation events over the past several decades, and this is expected to continue based on future climate projections. Flooding has increased in association with rising annual precipitation and extreme precipitation events, putting fish, wildlife, and their habitats at greater risk. More information about how extreme precipitation is changing can be found on the Extreme Precipitation, Storms and Floods page. Drought conditions lasting 1-3 months have occurred in the Northeast U.S. approximately every 2-3 years. Projections of future drought remain uncertain, but our best understanding suggests short-term droughts of 1-3 months will increase, while long-term drought conditions may not change considerably from historical periods. More information about drought can be found here. 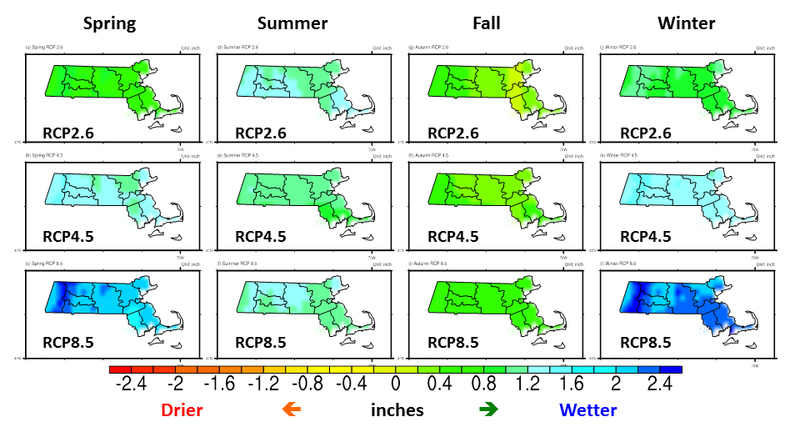 Projected changes in seasonal mean precipitation across Massachusetts using high resolution downscaled data and RCP 2.6 (low), 4.5 (medium), and 8.5 (high) emission scenarios. Values represent the change between the 1950-1999 and the 2050-2099 averages. Caution should be taken when interpreting these future maps, as precipitation models can vary widely in where they place precipitation maxima and minima spatially. The most reliable information is that precipitation increases are expected to be greatest in winter and spring. Figure created by and used with permission by L. Ning. 2. DeGaetano, A. T. 2009. Time-dependent changes in extreme-precipitation return-period amounts in the continental United States. Journal of Applied Meteorology and Climatology 48:2086-2099. 3. Douglas, E. M., and C. A. Fairbank. 2011. Is Precipitation in Northern New England Becoming More Extreme? Statistical Analysis of Extreme Rainfall in Massachusetts, New Hampshire, and Maine and Updated Estimates of the 100-Year Storm. Journal of Hydrologic Engineering 16(3):203-217. 4. Grimm, N. B., et al. 2013. The impacts of climate change on ecosystem structure and function. Frontiers in Ecology and the Environment 11:474–482. 5. Groisman, P. Y., R. W. Knight, D. R. Easterling, T. R. Karl, G. C. Hegerl, and V. N. Razuvaev. 2005. Trends in intense precipitation in the climate record. Journal of Climate 18:1326-1350. 6. Groisman, P. Y., R. W. Knight, and O. G. Zolina. 2013. Recent Trends in Regional and Global Intense Precipitation Patterns. Climate Vulnerability: Understanding and Addressing Threats to Essential Resources. Academic Press:25-55. 7. Guilbert, J., A. K. Betts, D. M. Rizzo, B. Beckage, and A. Bomblies. 2015. Characterization of increased persistence and intensity of precipitation in the northeastern United States. Geophysical Research Letters 42:1888-1893. 8. Hawkins, E. and R. Sutton. 2011. The potential to narrow uncertainty in projections of regional precipitation change. Climate Dynamics 37:407-418. 10. Horton R., W. Solecki, and C. Rosenzweig. 2012. Climate change in the Northeast: A Sourcebook. Draft Technical Input Report prepared for the U.S. National Climate Assessment. 313 p.
11. Kendon, E. J., N. M. Roberts, H. J. Fowler, M. J. Roberts, S. C. Chan, and C. A. Senior. 2014. Heavier summer downpours with climate change revealed by weather forecast resolution model. Nature Climate Change 4:570-576. 12. Kharin, V. V., F. Zwiers, X. Zhang, and M. Wehner. 2013. Changes in temperature and precipitation extremes in the CMIP5 ensemble. Climatic Change 119:345-357. 13. Knutti, R. and J. Sedláček. 2013. Robustness and uncertainties in the new CMIP5 climate model projections. Nature Climate Change 3:369-373. 14. Kunkel, K. E. 2013. Regional climate trends and scenarios for the US National Climate Assessment. US Department of Commerce, National Oceanic and Atmospheric Administration, National Environmental Satellite, Data, and Information Service. 16. Parr, D. and G. Wang. 2014. Hydrological changes in the U.S. Northeast using the Connecticut River Basin as a case study: Part 1. Modeling and analysis of the past. Global and Planetary Change 122:208-222. 17. Peterson, T. C., et al. 2013. Monitoring and Understanding Changes in Heat Waves, Cold Waves, Floods, and Droughts in the United States: State of Knowledge. Bulletin of the American Meteorological Society 94:821-834. 18. Rawlins, M. A., R. S. Bradley, and H. F. Diaz. 2012. Assessment of regional climate model simulation estimates over the northeast United States. Journal of Geophysical Research: Atmospheres 117:D23112. 19. Schoof, J. T. 2015. High resolution projections of 21st century daily precipitation for the contiguous US. Journal of Geophysical Research: Atmospheres: doi:10.1002/2014JD022376. 20. Scoccimarro, E., S. Gualdi, M. Zampieri, A. Bellucci, and A. Navarra. 2013. Heavy precipitation events in a warmer climate: results from CMIP5 models. Journal of Climate 26:7902–7911. 21. Sillmann, J., V. Kharin, F. Zwiers, X. Zhang, and D. Bronaugh. 2013. Climate extremes indices in the CMIP5 multimodel ensemble: Part 2. Future climate projections. Journal of Geophysical Research: Atmospheres 118:2473-2493. 23. Thibeault, J. M. and A. Seth. 2014. Changing climate extremes in the Northeast United States: observations and projections from CMIP5. Climatic Change 127:273-287. 24. Toreti, A., P. Naveau, M. Zampieri, A. Schindler, E. Scoccimarro, E. Xoplaki, H. A. Dijkstra, S. Gualdi, and J. Luterbacher. 2013. Projections of global changes in precipitation extremes from Coupled Model Intercomparison Project Phase 5 models. Geophysical Research Letters 40:4887-4892. 25. Walsh, J., et al. 2014. Chapter 2: Our Changing Climate. Climate Change Impacts in the United States: The Third National Climate Assessment. J. M. Melillo, T. (.C.). Richmond, and G. W. Yohe (eds.). U.S. Global Change Research Program:19-67. 26. Wuebbles, D., et al. 2014. CMIP5 Climate Model Analyses: Climate Extremes in the United States. Bulletin of the American Meteorological Society 95:571-583.